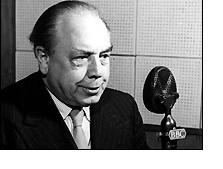 John Boynton Priestley (1894–1984) had a writing career of over sixty years, and produced numerous plays and novels. He is best remembered for his novel The Good Companions (1929), but he produced a number of plays and novels of science-fictional interest. The ones that have survived best are probably his “time-plays”, which derive their inspiration from the once-popular ideas about time formulated by J.W. Donne: all time is in a sense contemporaneous, and time-slippages from one time to another can happen. Time and the Conways (1937) is the best-known, but there are also Dangerous Corner (1932) and I Have Been Here Before (1937). Summer Day’s Dream (1949) is a play set after World War Three. The Magicians (1954) is reckoned by John Clute (in the extensive treatment of Priestley in the Encyclopedia of Science Fiction) to be “Priestley’s closest approach to a full-fledged sf novel”; it is a “time-novel”. The Doomsday Men (1938) has a mad scientist with a doomsday weapon in Los Angeles. Priestley wrote for younger readers too: The Thirty-First of June: A Tale of True Love, Enterprise and Progress, in the Arthurian and Ad-Atomic Ages (1961) is a a comic fantasy with satire about advertising and television, and Snoggle: A Story for Anybody Between 9 and 90 (1971) is a story about an alien pet belonging to advanced beings in a flying saucer, which is saved by three children and an old man from bigoted yokels. John Priestley (the Boynton appeared mysteriously at a later date) was born in Bradford, Yorkshire. His mother died when he was two, and his school-master father married again two years later. Priestley left school at 16, to work as a clerk, but it was not long before he had his own column in the Bradford Pioneer, a Labour Party weekly. His war experiences cover the whole period of the war: he was in the Army from September 1914 to spring 1919. In 1919 he took advantage of a grant which funded officers to go to university, and he read English and History, and later History and Political Science, at Trinity Hall, Cambridge. Eight days after getting his BA, in June 1921, he married his long-time girl-friend Pat Tempest in Bradford. He published his first two books in 1922, and then worked as a freelance in London for numerous publications. He had two children with Pat, who died of cancer in 1925. He married Jane Wyndham Lewis in 1926 (with whom he had already started an affair before his wife’s death). The marriage ended in divorce nearly thirty years later, and during these years Priestley had relationships with other women, including the actress Peggy Ashcroft and the writer and archaeologist Jacquetta Hawkes. He married Jacquetta Hawkes in 1953, after a very public divorce contested by her husband Christopher Hawkes (later the Professor at Oxford’s Institute of Archaeology, and my own doctoral supervisor). Priestley was a prolific writer throughout his career, producing plays, novels, literary criticism, and biography. The long novel The Good Companions (1929) was hugely successful, although many people think his best novel was the next one, Angel Pavement (1930). English Journey (1933) was his report on the state of England, which exposed the horrors of poverty and unemployment. From June to October 1940 he delivered his “Postscripts” on BBC Radio, immediately after the 9 o’clock news, which brought his voice to the entire nation. Some of them were comic, but many were political: in particular he reminded the nation of those veterans of the Great War who returned home to unemployment and poverty, and demanded that it should not happen after the current war. There was a demand that Priestley be removed, for being too political, and, although the BBC received a huge number of letters supporting him, he was dropped. In 1945 Priestley stood as an independent candidate for the Cambridge University seat, on a largely socialist agenda, but was defeated. In 1945 he wrote probably his best play, An Inspector Calls, and not being able to find a venue for it, sent it to his Russian translator: its première was therefore in Moscow and Leningrad, in 1945 and only reached London in 1946. This play was a socialist critique of British society. Priestley continued to be a thorn in the flesh of the Establishment after the Second World War. In 1957 an article he wrote led to the founding of the Campaign for Nuclear Disarmament. He was determined never to become part of the Establishment, and turned down a knighthood and a peerage, although he did accept the Order of Merit in 1977. My information comes largely from Judith Cook’s article in the Oxford Dictionary of National Biography.